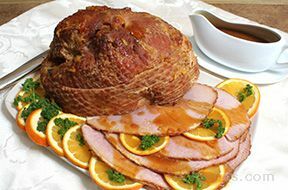 The perfect way to prepare and bake a ham is with the addition peach preserves to help create a glistening entrÃƒÂ©e that tastes as good as it looks. Use our baked ham recipes. Remove any extra skin from ham. If not spiral cut, score ham 1/8" deep in diamond pattern. Place ham, fat side up on rack. Stir in preserves, mustard and 1 cup apricot nectar in medium bowl. Pour over ham. Bake ham uncovered at 350Â° F. for 1 1/2 - 2 hours or until meat thermometer reaches 140 degrees F.; adding more apricot nectar to bottom of pan as needed. When done baking, transfer ham to serving platter. Let stand 15 minutes before carving. Pour pan drippings into medium saucepan. Add 2 more small cans of nectar if needed. Serve sauce hot with ham.